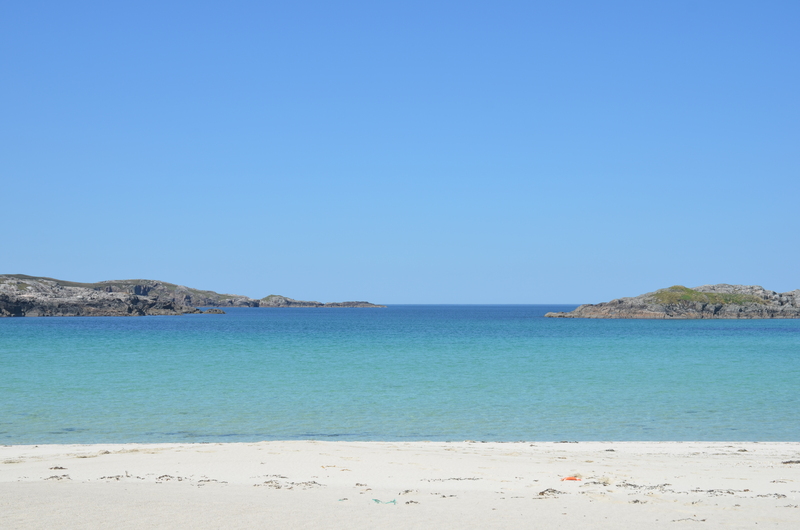 It is vital that you book ahead during the summer to make sure you have somewhere to eat in Uig; although many visitors also eat out during the day on their travels around the island. It is very difficult for us to reccomend one establishment in front of another - they are all unique in their own way! Perhaps check out TripAdvisor to gave you a flavour (sorry for another awful pun...) of how visitors have felt about them? Excellent English cuisine in a beautiful setting! Set Menu served at 7pm. Call Richard for reservations - booking essential. Great food in converted old school house - Call MaryAnn for more details. Telephone 01851 672211 for more information. Serving fabulous home baking, the Community Centre Cafe is open from 12pm - 5pm Monday to Saturday - perfect for a quick snack meal! Perfect for all your picnic needs! If you get really stuck! 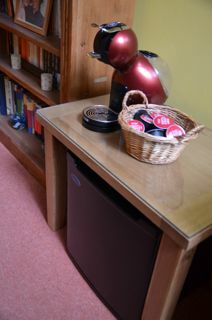 We have added a small fridge and coffee machine if you feel like spoiling yourself! The fridge will contain some snack materials - there are plates etc in your room. It will work on an 'honesty box' system with some suggested prices available. 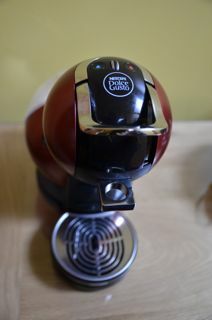 Coffee machine instructions - how many websites offer you such thrills??!! 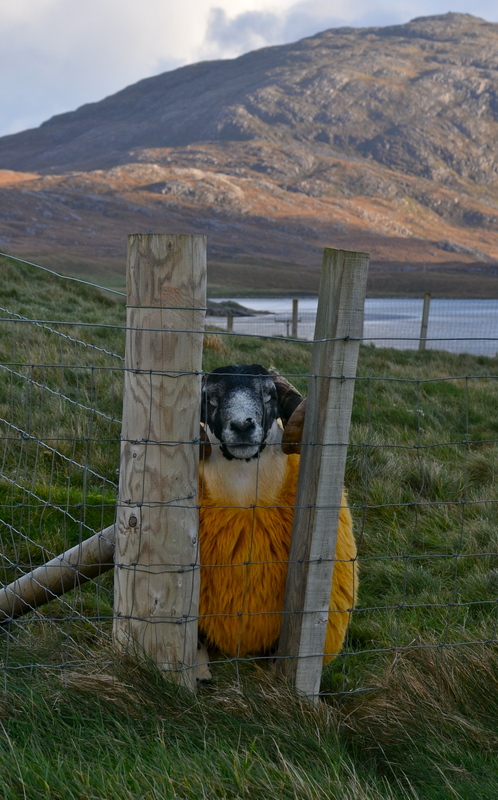 Welcome to Farawaybucks - possibly the UK's most remote coffee location! Here are the instructions for our little machine! We will keep it regularly filled with fresh water but should it require filling, just lift off the clear water container, take out the black plastic 'Dolce Gusto' stopper, add water and replace. To turn on the machine, press the button on the left hand side as you look at the machine and wait for it to go from flashing red to solid green. Choose your drink from the options provided - remember some will take two pods. 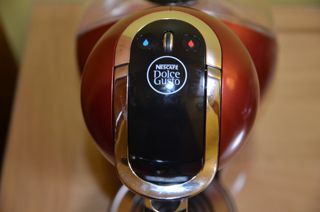 To insert the pods, lift up the silver handle and pull out the capsule holder. Add the pod you would like to use and then push the handle back down. Depending on the drink you have chosen, you will need to adjust the amount of water required. On the top of the machine there is a blue button for cold water and a red button for hot water. In between these two buttons there is a dial to increase or decrease the amount of water used. Check the information sheet for how much water is required. If you get stuck - just shout! 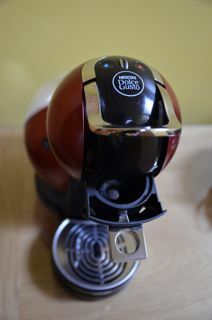 Depending on the type of drink that you would like, you will need to adjust the amount of water that the machine uses. Simply adjust up or down until the correct number of green lights is displayed. Place the cup underneath then press the red button. If you need another pod, just repeat the same steps.